^ a b For China Family Panel Studies 2017 survey results see release #1 (archived) and release #2 (archived). The tables also contain the results of CFPS 2012 (sample 20,035) and Chinese General Social Survey (CGSS) results for 2006, 2008 and 2010 (samples ~10.000/11,000). 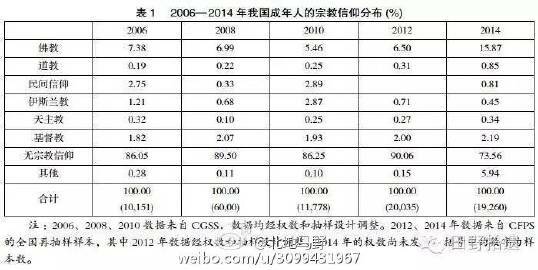 Also see, for comparison CFPS 2012 data in Lu 卢, Yunfeng 云峰 (2014). "卢云峰：当代中国宗教状况报告——基于CFPS（2012）调查数据" [Report on Religions in Contemporary China – Based on CFPS (2012) Survey Data] (PDF). World Religious Cultures (1). Archived from the original (PDF) on 9 August 2014. p. 13, reporting the results of the CGSS 2006, 2008, 2010 and 2011, and their average (fifth column of the first table). ^ a b Gladney, Dru C. (2003). "The China Quarterly - Islam in China: Accommodation or Separatism? - Cambridge Journals Online". Cambridge.org. 174. doi:10.1017/S0009443903000275. Archived from the original on 2011-05-24. Retrieved 2010-11-28. ^ "The World Factbook". cia.gov. Archived from the original on 2016-10-13. Retrieved 2007-05-30. 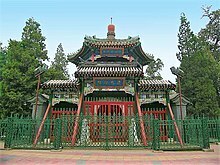 ^ "China halts mosque demolition due to protest". Archived from the original on 2018-08-11. Retrieved 2018-08-10. ^ "TheHalalJournal". Archived from the original on 2011-10-06. Retrieved 2010-12-26. ^ Herbert Allen Giles (1926). Confucianism and its rivals. Forgotten Books. p. 139. ISBN 978-1-60680-248-9. Archived from the original on 2013-06-03. Retrieved 2011-12-14. ^ a b Younus, Farrukh I. (2011-02-18). "Farrukh Travels Into the Muslim History of China - ارشيف اسلام اونلاين". Islamonline.net. Archived from the original on 2011-02-18. Retrieved 2016-09-17. ^ "Imam Asim Shrine and Ancient Tomb". wikimapia.org. Archived from the original on 2011-05-24. Retrieved 2010-11-29. 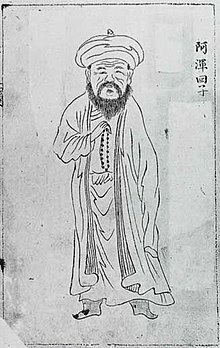 ^ "Niya / Minfeng". Central Asia Traveler. Archived from the original on February 3, 2015. Retrieved 7 July 2015. ^ 悠悠历史网 (28 August 2016). "蒙古族与他族通婚". 悠悠历史网--中国历史及世界历史知识百科！. Archived from the original on 2016-10-11. ^ "元代内迁哈剌鲁人的文化变迁". 中国论文网. Archived from the original on 2016-10-11. 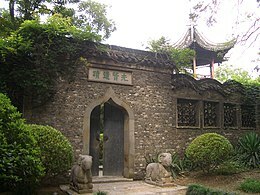 ^ 蔡, 春娟 (2004-04-07). "2002年国内蒙元史研究综述". 欧亚学研究 《中国史研究动态》. Archived from the original on 2017-02-14. ^ 马, 娟 (2002). "元代色目高丽通婚举例". 宁夏社会科学. Archived from the original on 2017-02-14. 马, 娟 (2002). "元代色目高丽通婚举例". 宁夏社会科学. Archived from the original on 2016-10-11. ^ Michael Dillon (1999). China's Muslim Hui community: migration, settlement and sects. Richmond: Curzon Press. p. 24. ISBN 978-0-7007-1026-3. Retrieved 2010-06-28. ^ Johan Elverskog (2010). Buddhism and Islam on the Silk Road (illustrated ed.). University of Pennsylvania Press. p. 228. ISBN 978-0-8122-4237-9. Retrieved 2010-06-28. ^ Dru C. Gladney (1991). Muslim Chinese: ethnic nationalism in the People's Republic (2nd illustrated reprint ed.). Council on East Asian Studies, Harvard University. p. 234. ISBN 978-0-674-59495-1. Retrieved 2010-06-28. 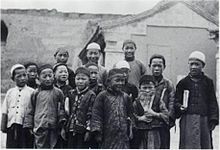 ^ a b "China's Islamic Communities Generate Local Histories | China Heritage Quarterly". Archived from the original on 2016-10-16. Retrieved 2016-04-18. ^ Robinson, David M. "Eight The Ming Court and the Legacy of the Yuan Mongols" (PDF). Culture, Courtiers and Competition: The Ming Court (1368-1644). Harvard University Asia Center. p. 384. Archived (PDF) from the original on 2016-06-11. Retrieved 2016-05-04. ^ Chen, Da-Sheng. "CHINESE-IRANIAN RELATIONS vii. Persian Settlements in Southeastern China during the T'ang, Sung, and Yuan Dynasties". Encyclopedia Iranica. Archived from the original on 2011-04-29. Retrieved 2010-06-28. ^ Susan Naquin (2000). Peking: temples and city life, 1400-1900. University of California Press. p. 214. ISBN 978-0-520-21991-5. Retrieved 2010-11-28. ^ Daniel Leslie, Donald (1998). "The Integration of Religious Minorities in China: The Case of Chinese Muslims" (PDF). The Fifty-ninth George Ernest Morrison Lecture in Ethnology. p. 15. Archived from the original (PDF) on 2010-12-17. Retrieved 2011-12-15. ^ Gek Nai Cheng (1997). Osman Bakar, ed. Islam and Confucianism: a civilizational dialogue. Published and distributed for the Centre for Civilizational Dialogue of University of Malaya by University of Malaya Press. p. 77. ISBN 978-983-100-038-0. Retrieved December 20, 2011. ^ "A rare blue and white screen Zhengde six-character mark and of the period". Bonhams. Archived from the original on 2016-08-21. Retrieved 2016-09-17. ^ "Culture, Courtiers, and Competition : The Ming Court (168-1644)" (PDF). History.ubc.ca. Archived (PDF) from the original on 2016-10-06. Retrieved 2016-09-18. ^ "pp. 5, 17" (PDF). Archived (PDF) from the original on 2016-12-20. Retrieved 2016-05-04. ^ "澳門海洋文化的若干問題" (PDF). Ipm.edu.mo. Archived from the original (PDF) on 2014-02-02. Retrieved 2016-09-17. ^ Allès, Elizabeth (17 January 2007) [September–October 2003]. "Notes on some joking relationships between Hui and Han villages in Henan". China Perspectives. 2003 (49): 6. Archived from the original on 2010-06-30. Retrieved 2011-07-20. ^ LEI, Wan (February 2010). 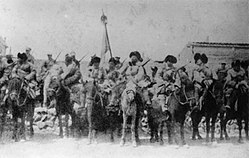 "The Chinese Islamic "Goodwill Mission to the Middle East" During the Anti-Japanese War". Dîvân DİSİPLİNLERARASI ÇALIŞMALAR DERGİSİ. 15 (29): 139–141. Archived from the original on 2014-03-18. Retrieved 19 June 2014. ^ LEI, Wan (2010). "The Chinese Islamic "Goodwill Mission to the Middle East" During the Anti-Japanese War". Dîvân Disiplinlerarasi Çalişmalar Dergisi. 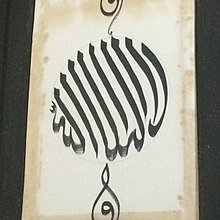 cilt 15 (sayı 29): 139–141. Archived from the original on 2014-03-18. Retrieved 19 June 2014. ^ Central Press (30 Jul 1937). "He Offers Aid to Fight Japan". Herald-Journal. Archived from the original on 2015-09-23. Retrieved 2010-11-28. ^ "让日军闻风丧胆地回族抗日名将". Chinaislam.net.cn. Archived from the original on 2017-07-02. Retrieved 2016-09-17. ^ "还原真实的西北群马之马步芳 骑八师中原抗日 - 历史 - 穆斯林在线-打造全球最大的伊斯兰中文门户网站". Muslimwww.com. Archived from the original on 2016-08-27. Retrieved 2016-09-17. ^ "ALLÈS & CHÉRIF-CHEBBI & HALFON 2003" (PDF). 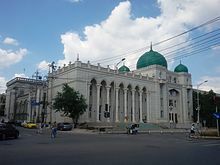 islamichina.com. p. 12. Archived (PDF) from the original on 2016-04-29. Retrieved 2014-07-26. ^ Lim, Louisa (6 February 2007). "Ban Thwarts 'Year of the Pig' Ads in China". National Public Radio. Archived from the original on 2017-12-01. Retrieved 2018-04-05. ^ Senate (U S ) Committee on Foreign Relations (2005). State Dept (U S ), ed. Annual Report on International Religious Freedom, 2004. Compiled by State Dept (U S ) (illustrated ed.). Government Printing Office. pp. 159–60. ISBN 978-0160725524. Retrieved 24 April 2014. ^ Su Jinbao (8 November 2015). 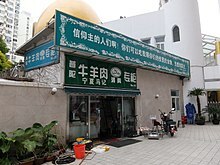 "Chinese-Arabic School Muslim Students Graduation Ceremony 临夏中阿学校第二十二届毕业典礼 金镖阿訇讲话2007". Archived from the original on 2017-04-29. Retrieved 2016-05-27 – via YouTube. ^ Su Jinbao (8 November 2015). "Chinese Muslim Makes a Speech in Islamic Girl School 老华寺女校举行演讲仪式 上集". Archived from the original on 2017-02-11. Retrieved 2016-05-27 – via YouTube. ^ nottc (11 September 2011). "Muslim in China, Graduation ceremony of a Islamic girls' school". Archived from the original on 2017-04-01. Retrieved 2016-05-27 – via YouTube. ^ Senate (U S ) Committee on Foreign Relations (2005). Annual Report on International Religious Freedom, 2004 (illustrated ed.). Government Printing Office. p. 160. ISBN 978-0160725524. Retrieved 24 April 2014. ^ Beech, Hannah (Aug 12, 2014). 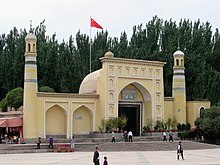 "If China Is Anti-Islam, Why Are These Chinese Muslims Enjoying a Faith Revival?". TIME magazine. Archived from the original on 2015-06-13. Retrieved 25 June 2015. ^ Szadziewski, Henryk (10 November 2018). "'Purify' or perish: the vulnerable lives of China's Uyghur scholars". Hong Kong Free Press. Retrieved 11 November 2018. ^ "China has an ISIS problem". Theweek.com. 2015-03-02. Archived from the original on 2016-12-11. Retrieved 2016-09-17. ^ "Islamic State executes three of its Chinese militants: China paper". Reuters. 2015-02-05. Archived from the original on 2016-09-18. Retrieved 2016-09-17. ^ a b Creery, Jennifer (25 July 2018). "NGOs note 'staggering' rise in arrests as China cracks down on minorities in Muslim region". Hong Kong Free Press. Archived from the original on 2018-07-25. Retrieved 26 July 2018. ^ a b c "No place to hide: exiled Chinese Uighur Muslims feel state's long reach". 19 August 2018. Archived from the original on 2018-08-19. Retrieved 20 August 2018. ^ Lim, Louisa (7 November 2018). "China: re-engineering the Uighur". The Interpreter. Lowy Institute. Retrieved 10 November 2018. ^ "Mosque protest highlights China's shrinking religious spaces". Hong Kong Free Press/AFP. 11 August 2018. Archived from the original on 2018-08-14. Retrieved 14 August 2018. ^ Withnall, Adam (30 November 2018). "China sends state spies to live in Uighur Muslim homes and attend private family weddings and funerals". The Independent. Retrieved 23 August 2018. ^ Sudworth, John (10 August 2018). "China's hidden camps". BBC News. Retrieved 1 December 2018. What's happened to the vanished Uighurs of Xinjiang? ^ Philip Wen and Olzhas Auyezov (29 November 2018). "Tracking China's Muslim Gulag". Reuters. Retrieved 1 December 2018. ^ Shih, Gerry (16 May 2018). "Chinese mass-indoctrination camps evoke Cultural Revolution". Associated Press. Archived from the original on 2018-05-17. Retrieved 17 May 2018. Phillips, Tom (25 January 2018). "China 'holding at least 120,000 Uighurs in re-education camps'". The Guardian. Archived from the original on 2018-08-19. Retrieved 17 May 2018. Denyer, Simon (17 May 2018). "Former inmates of China's Muslim 'reeducation' camps tell of brainwashing, torture". Washington Post. Archived from the original on 2018-05-16. Retrieved 17 May 2018. ^ Thum, Rian (22 August 2018). "China's Mass Internment Camps Have No Clear End in Sight". Foreign Policy. Retrieved 23 August 2018. ^ Kuo, Lily (13 August 2018). "China denies violating minority rights amid detention claims". The Guardian. Archived from the original on 2018-08-14. Retrieved 14 August 2018. ^ "UN 'alarmed' by reports of China's mass detention of Uighurs". BBC News Asia. 31 August 2018. Retrieved 1 December 2018. ^ Lars-Erik Nyman (1977). Great Britain and Chinese, Russian and Japanese interests in Sinkiang, 1918-1934. Stockholm: Esselte studium. p. 111. ISBN 978-91-24-27287-6. Retrieved 2010-06-28. ^ Beech, Hannah (August 12, 2014). "If China Is Anti-Islam, Why Are These Chinese Muslims Enjoying a Faith Revival". Time magazine. TIME. Archived from the original on 2017-06-17. Retrieved June 17, 2017. ^ Van Wie Davis, Elizabath. "Uyghur Muslim Ethnic Separatism in Xinjiang, China". Asia-Pacific Center for Security Studies. Archived from the original on 2009-06-17. Retrieved 2010-06-28. ^ Safran, William (1998). Nationalism and ethnoregional identities in China. Psychology Press. p. 35. ISBN 978-0-7146-4921-4. Retrieved 2011-01-11. ^ Zenn, Jacob (March 17, 2011). "Jihad in China? Marketing the Turkistan Islamic Party". Terrorism Monitor. 9 (11). Archived from the original on 2015-09-30. Retrieved 18 September 2015. ^ Safran William (13 May 2013). Nationalism and Ethnoregional Identities in China. Routledge. pp. 36–. ISBN 978-1-136-32423-9. Safran William (13 May 2013). Nationalism and Ethnoregional Identities in China. Routledge. pp. 36–. ISBN 978-1-136-32416-1. ^ Huan Gao (15 July 2011). Women and Heroin Addiction in China's Changing Society. Taylor & Francis. ISBN 978-1-136-66156-3. ^ "Uighurs do not face harsh oppression, Anadolu Agency reporters claim". Daily Sabah. ISTANBUL. 2015-07-08. Archived from the original on 2015-12-08. ^ a b c Fischer, Andrew Martin (September 2005). "Close encounters of in Inner-Asian kind: Tibetan–Muslim coexistence and conflict in Tibet, past and present" (PDF). CSRC Working Paper Series (Working Paper no.68): 1–2. Archived from the original (PDF) on 3 January 2006. Retrieved 26 September 2015. ^ A.A. (Nov 11, 2012). "The living picture of frustration". The Economist. Archived from the original on 2014-02-23. Retrieved 2014-01-15. ^ "International Religious Freedom Report for 2011". state.gov. Archived from the original on 2014-04-12. Retrieved 20 April 2013. 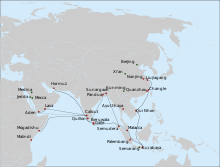 ^ "Region: Asia-Pacific". Pew Research Center's Religion & Public Life Project. 27 January 2011. Archived from the original on 2017-10-10. Retrieved 2014-05-21. 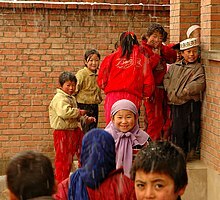 ^ "Exemptions in China's 'one-child policy' - iLook China". iLook China. 2010-11-05. Archived from the original on 2014-05-12. Retrieved 2014-05-21. ^ "China: The Best and the Worst Place to Be a Muslim Woman". Foreign Policy. 2015-07-17. Archived from the original on 2016-09-09. Retrieved 2016-09-17. ^ James Hastings; John Alexander Selbie; Louis Herbert Gray (1916). Encyclopædia of religion and ethics, Volume 8. T. & T. Clark. p. 893. Retrieved 2010-11-28. ^ Jiang, Shelley (2004-12-13). Let's Go China 5th Edition. ISBN 9780312320058. ^ "Halal Food in China". Muslim2china.com. Archived from the original on 2016-08-23. Retrieved 2016-09-17. ^ Liu, Caiyu (9 October 2018). "Officers, Party members urged to strengthen faith". Global Times. Retrieved 10 November 2018. ^ Jonathan Neaman Lipman (2004). Familiar strangers: a history of Muslims in Northwest China. Seattle: University of Washington Press. p. 79. ISBN 978-0-295-97644-0. Retrieved 2010-06-28. ^ Ruth Hayhoe (1996). China's universities, 1895-1995: a century of cultural conflict. Taylor & Francis. p. 202. ISBN 978-0-8153-1859-0. Retrieved 2010-06-29. ^ Sherwood, Harriet. "Women lead Friday prayers at Denmark's first female-run mosque". The Guardian. Copenhagen. Archived from the original on 2016-10-17. ^ "First Generation of Female Imams Emerges in W. China". People's Daily Online: English-. August 24, 2003. Archived from the original on 2016-10-02. ^ A memorial to him was built.[where?] Aliya Ma Lynn (2007). 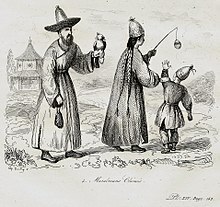 Muslims in China. University Press. p. 44. ISBN 978-0-88093-861-7. Retrieved 2010-06-28. ALLÈS, ÉLISABETH; CHÉRIF-CHEBBI, LEÏLA; HALFON, CONSTANCE-HÉLÈNE (2003). Translated from the French by Anne Evans. "Chinese Islam: Unity and Fragmentation" (PDF). Archives de Sciences Sociales des Religions. 31 (1): 7–35. doi:10.1080/0963749032000045837. ISSN 0963-7494. Retrieved 9 June 2014.